A week on and I'm still here and still waiting, perhaps a little less patiently than last week, but waiting none the less. I keep being asked if I'm excited and if I'm honest, the answer is no. The main feeling I've got at the moment is one of impatience, a sort of need to just get on with things now. And I could still have a couple more weeks to go, so I guess I need to do what I can to distract myself! At the end of last week, my mother took me completely by surprise when a large parcel was delivered by the postman. Inside it was crammed with blankets and baby cardigans, so time to give another shout of thank you for more baby gifts. She also crocheted a double layer blanket in yellow and white - I didn't know my mother could crochet, so that was a double surprise. It's gorgeous and sure to be useful if the good old British summer continues to be as unpredictable as ever! There were also several cardigans and a couple of blankets knitted by my mother's friends, plus a stack of blankets passed along by my little brother from when his daughter was a baby. So a big thank you to my Mum, my brother Gary and my Mum's friends. 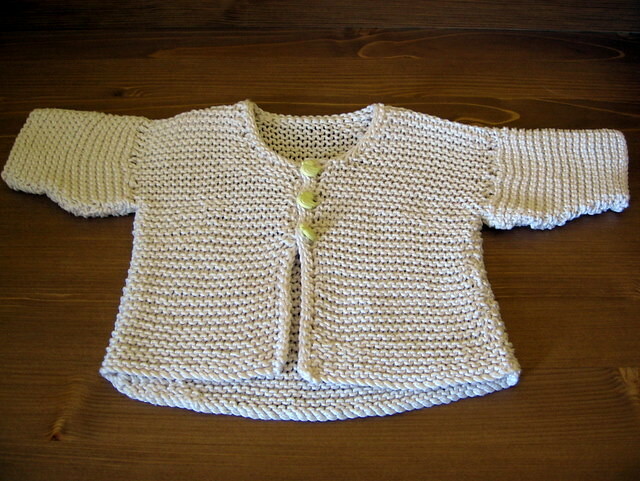 In the meantime, I've actually had a go at making a baby cardigan myself. I decided to make something simple and dithered for a while as to what exactly I should make. Then Dave came back from one of his usual wanders around a charity shop bearing a gift in the form of a book called Baby Gifts, The Australian Womens Weekly Craft Library. 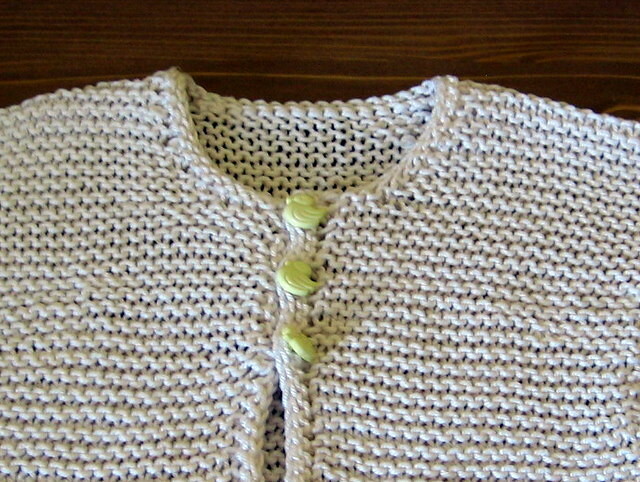 Inside I found a pattern for a simple garter stitch cardigan, so I had a go and here is the result. I knitted this one up in Paton's Cotton DK, left over from my Tiramisu blanket; the pattern called for 4mm needles, but being a tightish knitter I used 4.5mm so that I made gauge. I knit the 0-3 months size, so it should be wearable straight away and followed the pattern as best I could, but have to say it didn't seem to be terribly accurate. First problem was with the fronts, with the instructions for left and right rather confused. The pattern writer had assumed they'd be mirror images of each other, adjusting stitch/row counts accordingly, but then seemed to forget they'd done so half way through so there was no way they'd work. Next up, the instructions to pick up stitches for the bands wouldn't work no matter how I tried, so in the end I just picked up what seemed like a good number and placed button holes myself. I think it turned out OK and the little duck buttons seem to sit well, so hopefully I got it about right. Finally, I was concerned about how much bulk was being added to the shoulder and underarm area on such a tiny garment, so decided to pick up stitches at the shoulder and knit towards the wrist. I studied the original sleeve instructions and then picked up 40 stitches, knitted 12 rows before decreasing one stitch at the beginning and end of the next row. The pattern didn't say which kinds of decreases should be used, so I just knit two stitches together. After that, I continued to knit, repeating the decrease row every fourth row until I had 30 stitches left. Then I knit another 3 rows before casting off. I don't really have a lot of experience with seaming knitting, particularly garter stitch but I had a go with mattress stitch, discovering it doesn't produce as smooth a seam as I'd like. Still, I think it's serviceable and not too shoddy for my first knitted cardigan and baby garment. Not as good as the one's made for me, but I'm fairly pleased with the end result and I'm sure the baby won't notice! Lovely items as always Julie, not long to go now.